As the number of persons with vancomycin-resistant enterococci (VRE) and/or carbapenem-resistant Enterobacteriaceae (CRE) colonisation or prior infection increases – both among locals and foreigners – there will be inevitably more of such colonised/infected persons that will have medical indications for high risk procedures such as organ or stem cell transplantation (HSCT). The issue at hand is that there is a significant risk during the course of the transplantation that the bacteria will “escape” from the gut and cause infections elsewhere in the body. This is particularly the case for allogeneic HSCT (alloHSCT) in view of the gut mucositis (inflammation of the gut membrane lining) and profound neutropenia (low white blood cell counts) that arise as a consequence of the conditioning regimen, and immunosuppression for drugs to prevent rejection or graft-versus-host disease (GVHD) subsequently. I am focusing on stem cell transplantation (HSCT) first as this is a bit of a work-related hobby. What are other countries’ experiences in this regard? Universally, the published experience is that there are far more deaths (albeit variously defined, i.e. 7-day mortality, 30-day mortality, 1-year survival, etc.) 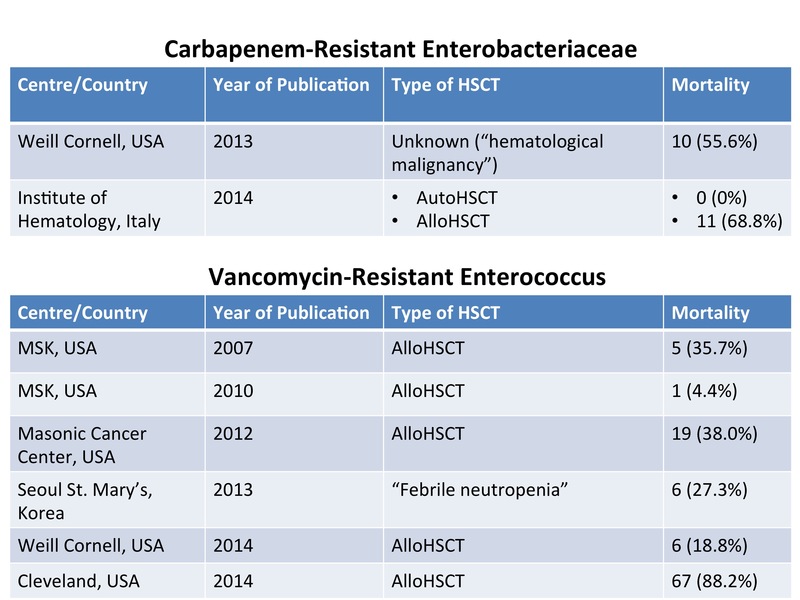 in patients who develop infections caused by VRE or CRE than their counterparts infected by less resistant bacteria (Table below). Part of the reason for the increased mortality is that such infections are much harder to treat – especially CRE where the antibiotics used are both more toxic and less efficacious compared to the beta-lactam antibiotics that are the “gold standard” of therapy. But even if they survive the infection by VRE or CRE, the subsequent mortality risk is still higher, which is a bit more difficult to grasp. Selected published outcomes of haematology patients with VRE or CRE severe infections. Given the heightened mortality risk, should these patients still be transplanted, especially with regards to alloHSCT? This difficult question requires a balancing of risks and costs. Most of these cases will have a high risk of haematological disease relapse and/or death if the transplant is not carried out (otherwise why go for alloHSCT in the first place, with its high attendant morbidity and mortality that usually ranges from 20% to 50% depending on the underlying haematological disease and patient condition). If the costs are borne by the individual or insurance plan, and if the patient understands the risks but decides to proceed with the alloHSCT, there is relatively little controversy. If the alloHSCT is to be done in a central public health system funded by taxation, then questions about appropriate resource allocation are bound to arise. Either way, there is an infection control problem to be handled – a “cost” not often factored into considerations of this nature – which is to prevent the patient’s VRE or CRE from spreading in the transplant unit. What can be done to minimise the risks? Ideally, patients with prior hospitalisation in a country that is endemic for CRE and/or VRE (that includes Singapore now, unfortunately) should be screened for CRE or VRE carriage prior to the alloHSCT, and the appropriate infection control measures applied if positive. Note that this short sentence fails to convey the difficulty in achieving adequate infection control that will successfully prevent the spread of these organisms. Decolonisation of carriage status is a strategy often employed for patients with methicillin-resistant Staphylococcus aureus (MRSA) carriage prior to major surgery. Unfortunately, there is currently no viable method for decolonising VRE. Various drugs have been used against CRE carriage, including oral polymyxins and oral aminoglycosides, singly or in combination. Two papers published in the American Journal of Infection Control and Infection Control & Hospital Epidemiology (abstracts only: pay wall issues) suggest limited success – and even in those where CRE were “eradicated”, no antibiotic challenge was attempted to determine if the CRE was still present, but just under the limit of laboratory detection. Early empiric prescription of antibiotics that can target CRE and/or VRE is recommended by experts for patients that carry these bacteria and subsequently develop sepsis during their HSCT. Because these drugs (polymyxins, tigecycline and aminoglycosides) are toxic and less effective (or not previous studied in the case of tigecycline) for febrile neutropenia, the addition of a broad-spectrum beta-lactam is also recommended. De-escalation of antibiotics is recommended if the cultures subsequently turn out to be negative for CRE, in order to decrease the antibiotic pressure. Such a strategy sounds reasonable, but has not been studied in any detail to date. It also seems logical to avoid fluoroquinolone (i.e. levofloxacin or ciprofloxacin) prophylaxis for patients with CRE carriage. The use of fluoroquinolone prophylaxis against febrile neutropenia has become standard at many haematology units following a New England Journal of Medicine publication in 2005 and subsequent positive meta-analysis by the Cochrane group. However, fluoroquinolones are a known risk factor for selecting out CRE, as has been shown in at least 2 publications here and here. This is a rapidly evolving area and I hope that there will be more evidence coming to light over the next few months/years.